About a month ago I was contacted to do a review on a book called, “How To Never Look Fat Again,” written by New York Times Bestselling author of How Not To Look Old Charla Krupp. At first I thought oh boy, here we go, another book telling us curvy girls that all we should wear is monochromatic looks and a-line skirts. Just to see if I was wrong or right, I decided to read it and see what Charla Krupp had to say. Charla Krupp has done more than 100 style segments on The Today Show and she has appeared on Good Morning America, Oprah, The View, Dateline NBC, and has been a regular on The E! Channel and Home Shopping Network. She was beauty director of Glamour, editor of In Style, beauty editor for People’s Style Watch and executive editor of Shop Etc. Magazine. Her writing has appeared in The New York Times, InStyle, Glamour, Shop Etc., People, Cosmopolitan, The Chicago Tribune, USA Today, and Time. Currently, Charla writes a monthly fashion column for More Magazine called Fashion For Grownups. Whether you dress to look thin or not, this book offers pretty good advice on how to achieve your best look with clothes. I loved the chapter titles like arm flap, buddha belly, and muffin top & back fat. As women whether big or small we can all identify with that body part that we wish was a little smaller or more toned. For me I am always thinking about my round stomach, which is why I went straight to the buddah belly chapter. The book is extremely detailed with advice and guides on what types of clothes to buy based on your problem areas. Charla even goes as far as to showing you what’s the best hair style for various face shapes. The book breaks down different looks into two categories, High Fat vs. No Fat. In the breakdown she uses a model and puts her in unflattering clothes to showcase the problem areas and then the same model is styled in a different outfit that makes her look slimmer. I think the advice in this book is truly genuine. Charla takes the time to share her personal struggles with trying to lose weight and realized that sometimes dieting is not the only answer when it comes to looking pounds thinner in your clothes. There are so many women out there that are uncomfortable with their bodies and are waiting to lose weight to dress better or think that you have to be skinny in order to look good in your clothes. Charla is offering another outlet to look and feel your best besides dieting like crazy. Some of the advice given is debatable in my opinion. In one section of the book, she talks about women with big butts. She has a list of things that they should stay away from and on that list was one of my favorite things, and that is skinny jeans. She says, “Skinny jeans are for skinny models. They do nothing to accommodate a real woman’s curves.” Sorry, but, I have to disagree. The RIGHT pair of skinny jeans will accentuate and make your curves look spectacular. It’s a good thing she started the big gooty chapter off by saying if you love and embrace your big booty then do the opposite of everything I say. I think this book is great for women who don’t understand their body shape or feel like their clothes doesn’t represent who they truly are or want to look like. There are tons of handy dandy lists that help you figure out the different types of fabric and cuts you should be wearing for your problem areas. There are little sections that tell you what to wear if you want to look thinner by tonight, how not to look fat in evening wear, and she even gives advice for women with thicker calves and wide feet. Much of the advice is easy to follow and will help you eliminate items in your wardrobe that really don’t work for you. Although the book is titled, “How Not To Look Fat,” it offers so much more. Besides glossy pictures of celebrities in their best and worst outfits, I think the books main purpose is to get you feeling better about your body no matter your size and I can appreciate that. Shaakira says: I dress to make my figure look flattering. I’m smaller at the top and larger at the bottom. I’m 5’10 and its not easy to buy jeans. I like jeans that are fitted. Wet seal stretch skinny jeans are long and fit me well. Tracey says: I dress to accentuate the parts of the body that I do like. I am 5’8, larger at the top, and smaller at the bottom. I like to wear clothes that highlight my breasts, as well as my legs. 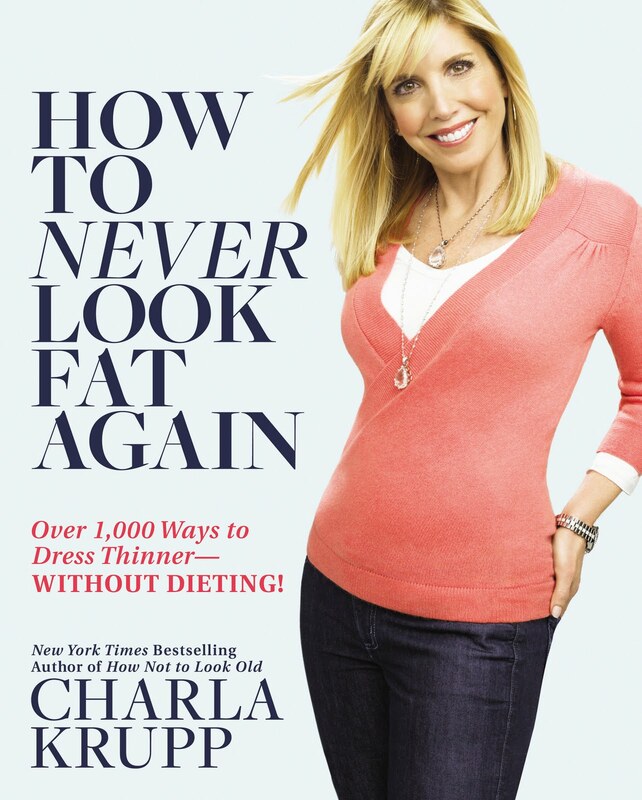 3 lucky readers can win a free copy of, “How Not To Look Fat” by Charla Krupp. The first three people to comment and send me an email with their full name and address will win a free copy. As a curvy girl, do you dress to look thin?